Your cake looks yummylicious!!! I so wish i had this recipe last weekend... My sis-in-law n i were hunting for a possible eggless cake recipe but were not satisfied with any we found... this one, am gonna try on the coming Saturday... and will call to tell you how soon the cake got over!!! I can visualize myself licking my fingers already!!! I am drooling at the sight of this wonderful chocolate cake it sounds amazinging chocolately nad delicious. wow..it looks so moist and perfect even without eggs..wonderful..This would just melt in the mouth..
wow that's a yumm Aparna, unfortunately i said no to chocolates for a while.....so don't want to look at this cake for a long time, will get tempted for sure!! Looks really delicious! 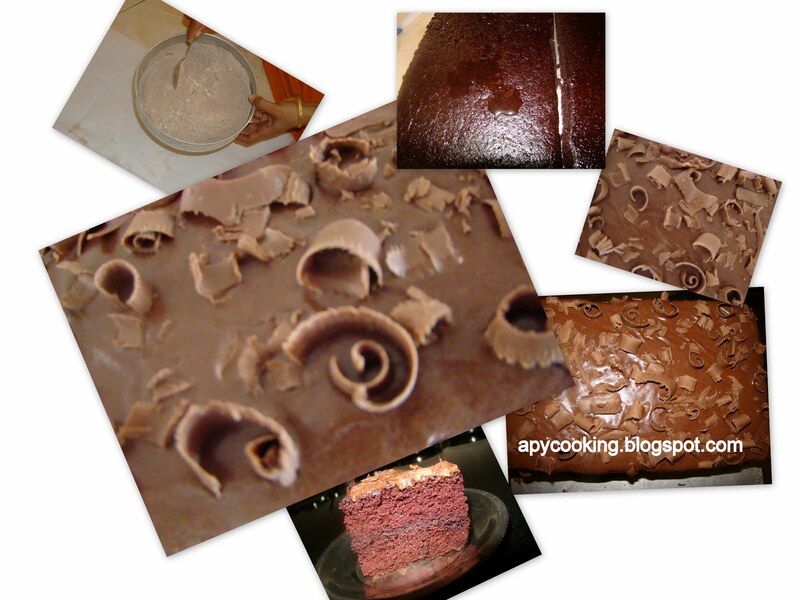 Thanks for visiting my blog... Do join us in India, we gotta make baking and all happen!! 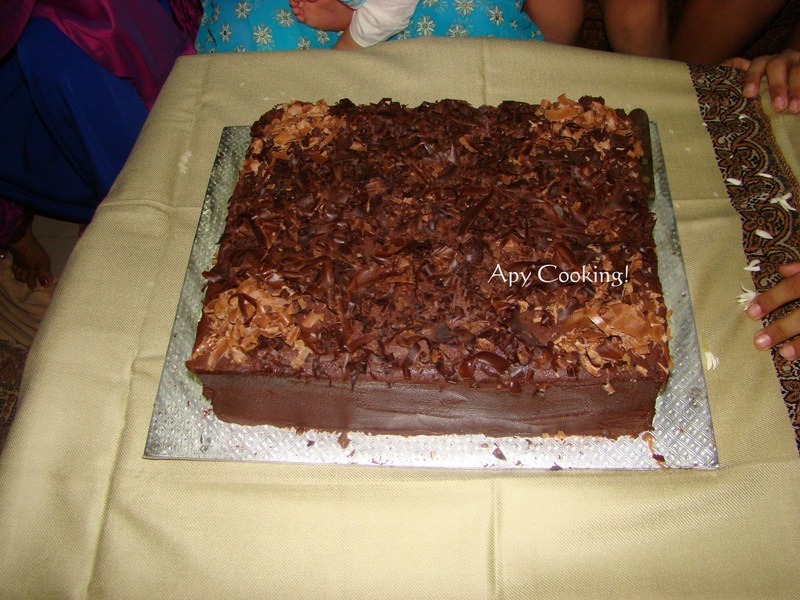 wow ... it is yumm yummy .. i love dark chocolate and eggless .. what better can it get ..
Beautiful cake and excellent step-by step pics.Herseys have got some excellent recipes in their site. WOW such a lovely cake also loved the chocolate shavings on top..... nice step by step photos too. Hi! Please visit my blog for a small surprise! Yummilicious dear, looks sooo inviting and tempting. Love all the pics too. Wow! That's a yummy-looking cake! Am happier that lack of materials or equipment did not hinder you than by the cake itself. That moist and fluffy cake looks delicious! I will enter the next challenge and I am laready thinking of a cake that does not require an oven! Oh my, this cake looks absolutely fabulous! Bookmarked, coz it's eggless, and I'm always being asked for those! The frosting and the cake is too die for. Got to try this one as my son is allergic to eggs, so this will be perfect! I always search for eggless cake recipes and came across yours. I will definitely try this. coz "similar to your about me" hands on was "after marriage" for me too wid calls to mom everyday!!! Your cake looks real yummy. I have a depression in m y cake whenever i bake.. It rises well and then drops in the centre. Can u help? Yummmmmmmmmm Cake, bookmarked to make it soon. I have tried your microwave eggless cakes (chocolate and coffee cakes) and they came out perfect. No one would believe that it did not have egg in it. But tried the above cake it came out good in look of the cake and texture but when I taste it it just tastes like a dough not cake (There is a huge difference between microwave and oven baked- Microwave was just perfect). Please any ideas? ( I recently became allergic to eggs) to make it even better? pls suggest me how to bake it in a microwave.